Make your happily-ever-after destination wedding all that you wish it would be and more with the help of Enchanted Honeymoons. Our skilled team of Omaha travel agents works with you to plan even the minor details of your big day, so the only thing on your schedule is enjoying each moment to the fullest. With wedding planners who are passionate about meeting your every request, we will coordinate how and when you arrive at your destination, your dream venue, the entertainment, and all of the aspects that will make your wedding unique and memorable. The allure of a Puerto Vallarta lies in its multitude of pristine, white sand beaches met by turquoise waters and electric-hued sunsets—a scene of pure bliss for a tropical wedding by the sea. With a grand selection of immaculate resorts, paradise is right at your fingertips along the tranquil shores of the Pacific Ocean. Whether you’re leaning toward a romantic getaway for two, an all-inclusive package, or a place where the whole family can relax, each can be found with amenities to your liking in Puerto Vallarta. Explore a few of the options below to determine which factors take priority in making your wedding day in Puerto Vallarta just that—yours. When it comes to packages that encompass everything under the Mexico sun, all-inclusive resorts offer an unparalleled experience. If you don’t want to worry about paying for meals or additional expenses, a resort like Melia Puerto Vallarata may be an ideal setting. 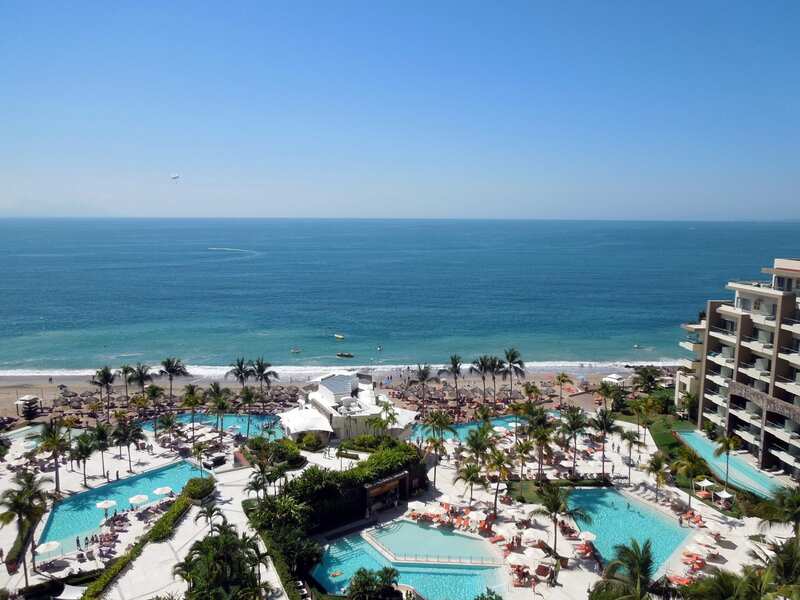 Whichever resort you choose, you can leave the stress of preparation and planning behind once you check in to one of Puerto Vallarta’s premiere all-inclusive resorts. Escape from the world to a seaside resort just for two, with storybook sunsets and majestic shorelines. Stay in an oceanfront suite at the Villa Premiere Hotel & Spa, or surround yourself with flourishing tropical gardens at Casa Velas Boutique Hotel. With numerous adult-only resorts in Puerto Vallarta that offer specialty lodging and event venues, your private destination wedding can be everything you envisioned and more. There’s no limit to just how grand your event can be, so if you’re looking for a destination spot to bring the whole clan, look no further. Many resorts in Puerto Vallarta offer family-friendly accommodations and group packages, so all of your guests can enjoy your big day in harmony—the more the merrier! Say “I do” on one of the many exotic beaches of Banderas Bay, known for its flowing mountain rivers and frequent whale sightings. Enjoy a sunset ceremony in a gazebo by the water at Dreams Villamagna Nuevo Vallarta, or take in a view of the ocean and the Sierra Madre Mountains on the lush, secluded beach of Las Caletas. Wherever you prefer, we’ll secure your picture-perfect venue for you. We offer exclusive packages with special rates for airfare and nightly stay to make your destination wedding affordable for all of your family and friends. The Puerto Vallarta International Airport (PVR) conveniently receives direct flights from a number of international airports throughout the United States, including Chicago, Dallas-Fort Worth, Denver, Los Angeles, Minneapolis, New York, Seattle, and many more. Discover the enchantment of Puerto Vallarta alongside the company of your closest friends and family by taking in some of its most endearing attractions. Visit the world-renowned Church of Our Lady of Guadalupe Parish, stroll the charming streets of The Romantic Zone, or explore the mysterious jungles of Banderas Bay. With famous historic sites and natural landmarks, your opportunities to explore beautiful Puerto Vallarta will satisfy your adventurous side. Sample the local flavors available at street food stands, from roasted fish on a stick to handmade tacos. You’re never too far from an array of fresh seafood and other delicacies in the spirited culture of Puerto Vallarta. Ride horseback along the shore or swim the lagoons of Quimixto Beach, snorkel and explore the bright reefs in Los Arcos National Marine Park, or take a relaxing day cruise along the famous coast of Los Muertos Beach. You’ll find endless opportunities for coastal entertainment all along the sun-soaked beaches of Puerto Vallarta. Celebrate your happiness at the lively bars and nightclubs of Puerto Vallarta. Walk with crowds along El Malecon boardwalk to find sensational live music and street performances, or dance the night away at some of the most popular night spots, like La Bodeguita del Medio, La Vaquita, and Xtine Disco. Is a destination wedding in Puerto Vallarta the perfect way to tie the knot for you and your love? Call 402-281-3022 to speak with your own Omaha travel agent at Enchanted Honeymoons and hear about how we can help you create your perfect destination wedding.